edshelf is a directory of websites, mobile apps, and desktop software that are rated & reviewed by educators, for educators. We decrease the friction of using and procuring effective technology into the classroom. Living in a connected age is double-edged. While policy and regulation have their place within this matrix, it seems that human agency should be the keystone. Therefore, for the body politic to walk the edge between being empowered by our connectivity or hindered by it requires a steady dose of mind training. Student art class in Yarmouth | Flickr - Photo Sharing! Yarmouth High School has extended Maine's MLTI program to its grade 9-12 students with gratifying results. In 2002, Maine initiated the Maine Learning Technology Initiative. Every 7th grader in the state received a laptop, which remained with that student through middle school. In 2004, when the first class of MLTI students reached the ninth grade, our district grappled with the question: what next? The Yarmouth School Department superintendent at the time, Dr. Ken Murphy, had heard Angus King speak and shared the then-governor’s belief that technology immersion could be transformational for teaching and learning. Since the state-funded program did not extend to high school students, Yarmouth chose to self-fund the laptops for Grade 9 and all high school teachers. We then added one grade per year. 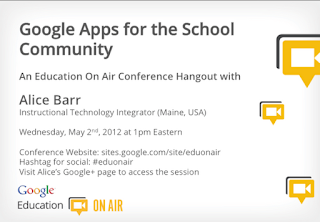 Google has announced a live On Air conference on May 2nd. Up to 8 people can join in an interactive session (a hangout). It will also be streamed live. And if you can't make those, it will be archived. Check out the list of sessions. 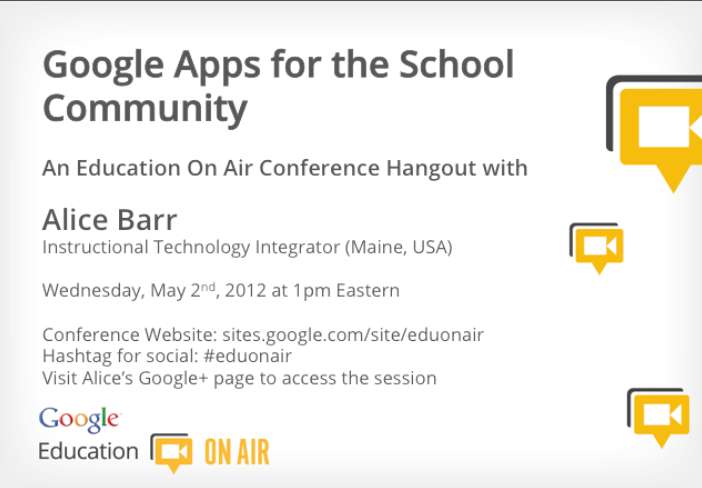 I will be presenting Google Apps for the School Community. recommend it to new users as you speak and present at various events. Socialba！ - The extension sync publish for social network! What makes the difference between a success story and a technology program that is abandoned due to lack of progress? Based on recent research and interviews with exemplary one-to-one districts, this eBook showcases five essential factors for a successful Implementation. Try guessing how many apps have permissions to access your private information... Now click the icons and get ready for a surprise! Use "The Energy WATCH" below to see how much carbon dioxide your school has emitted this week. If your school is at position number one, then your emissions have reduced the most compared to the previous week. Steve Hargadon: Live Wednesday April 4th - Howard Rheingold on His New Book, "Net Smart"
Email Me Form is a free online form generator service that helps you create HTML forms for your website, with no programming required. You can customise the look of text and headings in your document using the styles toolbar menu. The styles toolbar menu displays the style of your text selection in a document and lets you change the style or clear the formatting of your text. Animaps extends the My Maps feature of Google Maps by letting you create maps with markers that move, images and text that pop up on cue, and lines and shapes that change over time. When you send your Animap to friends it appears like a video - they can play, pause, slow and speed up the action! "We are the innovation unit for public services. As a not-for-profit social enterprise we're committed to using the power of innovation to solve social challenges. We have a strong track record of supporting leaders and organisations delivering public services to see and do things differently. They come to us with a problem and we empower them to achieve radically different solutions that offer better outcomes for lower costs." "This tutorial guides you through the steps of automating a help desk workflow."